In his debut collection Company, Sam Ross focuses on what lingers, exploring the idiosyncratic and at times seemingly indiscriminate nature of memory. When suffering takes many shapes and sizes yet appears as persistent fact, how may we forge memories that shimmer, so that love matches the loss? The answer often appears in the company we keep. 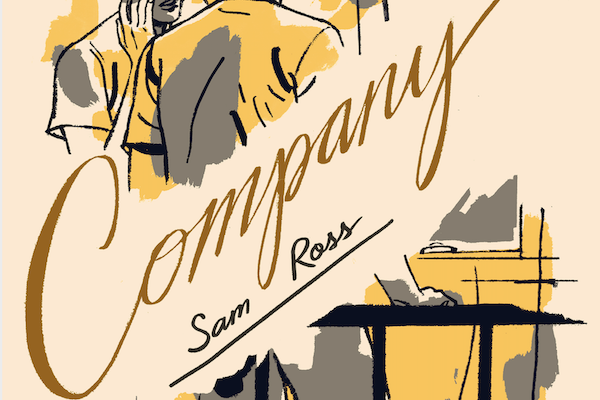 Ross captures how delicate and dangerous connection can be—especially sexual connections and the truths they reveal—yet Company offers testimony for not turning one’s back on those intimate ties that bind. what is backlit, behind me. These poems bookend “After Assault,” a striking piece where violence extinguishes the visual (“Quick to flee— // dark swam on a path no one else could see.”) Here Ross’s lines approach the ephemeral, as readers work alongside Ross to piece together what has happened: “Less the blood than the timing // Running till my mouth unlatched in the street.” The poem offers harrowing insistence that what remains is not event but feeling, enigmatic clues toward recreation. _____Blood resists form, handful of mercury. sign that says We are always in need. From bureaucratic discrimination to physical assault, the queer subject in Company knows its proximity to human violence. Within this landscape, even jokes from a cashier taking credit card information ring ominously (“And the last four digits, she said. And a fingerprint, she laughed. And your / blood, she laughed.”) As a result, when a narrator in one of Ross’ poems details the night they said love for the first time, it is a shock but not a surprise when the narrator notes awaking the next day with blood filling their eyes. Horatio is a queer poet, writer, and massage therapist. They are currently completing a doctoral degree in English literature at Princeton University. Their research explores queer heterotopic spaces and the phenomenology of gender fluidity in contemporary poetry, fiction, and performance art.